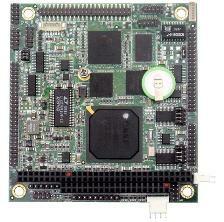 The Octavio embedded application servers are based on a mid-performance PC/104 form factor single board computers combining a low power, highly integrated CPU with Diamond Systems' renowned high-accuracy data acquisition circuitry on a single board. Octavio servers are powered by either an integrated Athena III (OCTAVIO-ATHE) or Helios (OCTAVIO-HLV) single board computer. Octavio systems come with 256MB or 1GB of soldered DRAM for increased resistance to shock and vibration. They also have a solid state flashdisk pre-loaded with a bootable Linux image and Diamond Systems' Universal Driver data acquisition programming software. Octavio incorporates advanced features such as four USB ports, one Gigabit or 10/100Base-T Ethernet interface, four serial ports, VGA graphics, and PS/2 keyboard and mouse interfaces. The Octavio enclosure is compact, light weight, and rugged. All system I/O is brought out to the front in the form of industry standard connectors. The internal structure of the enclosure eliminates most internal cables, improving reliability of the system. All Octavio servers are extremely rugged and have an operating temperature range of -40ºC to +85ºC. For block diagrams of the embedded single board computer functions please refer to the Athena III or Helios web pages. The optional data acquisition circuit provides high-accuracy, stable 16-bit A/D performance with up to 250KHz sample rate, wide input voltage capability up to +/-10V, and programmable input ranges. It includes 4 12-bit D/A channels, up to 40 programmable digital I/O lines, and two programmable counter/timers. A/D operation is enhanced by on-board FIFO with interrupt-based transfers, internal/external A/D triggering, and on-board A/D sample rate clock. The design of the analog circuitry ensures low-noise performance for critical applications. All data acquisition features are fully supported by our Universal Driver software to simplify application development. 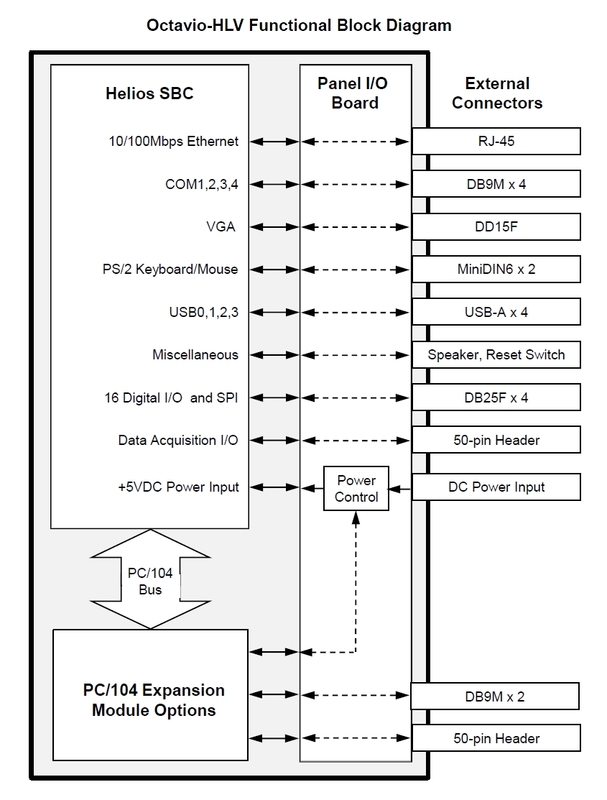 For more detailed Octavio data acquisition information, please refer to the Athena III or Helios single board computer web pages. Octavio embedded application servers come with an integrated solid state flashdisk pre-loaded with a Linux 2.6.23 bootable image and Diamond Systems' Universal Driver software version 6.02 for controlling the data acquisition circuitry. The flashdisk size can be specified when ordering. Octavio embedded application servers are configurable to meet the needs of your particular application. Many aspects of the system are configurable and are specified at the time of order. Octavio systems are ordered using the nomenclature OCTAVIO-P-F-D-S-R where the following configurable system attributes are defined as follows. The following sections describe these configuration options in more detail. 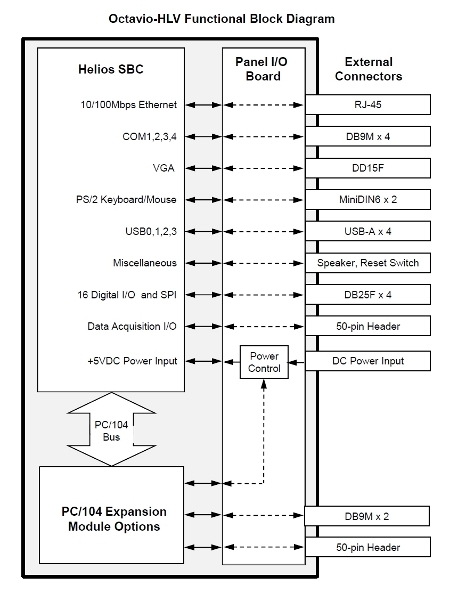 Several single board computer options exist that allow you to select the right balance of power and performance for your application, as well as whether to include the on-board data acquisition circuitry or not. For more detailed information on these SBCs, please visit our Athena II or Helios webpages. The size of the integrated flashdisk can be specified to give you enough room on-board for your application, thus eliminating the need for an additional hard drive. All flashdisks come with a Linux 2.6.23 bootable image and Diamond's Universal Driver 6.02 software pre-loaded. An integrated power supply can be added to the Octavio system, allowing Octavio to operate in environments where +5V is not accessible. A 25W or 50W power supply can be selected. For more detailed information on these power supply modules, please visit our 25W Jupiter-MM-LP power supply or 50W Jupiter-MM power supply webpages. When a power supply is added to the system, the enclosure must be at least 3" in height. The Octavio case comes in several different heights for I/O expansion. The standard case height is 1.7" for the basic system. If an integrated power supply is added, the case must be at least 3" in height. Octavio-ATHE systems must order option 30. A DIN rail adapter may be added to the Octavio system. Octavio systems come in standard, default configurations for various system aspects such as serial port configuration. Some of these may be configured to your specifications during manufacturing. The following options are available. When placing an order, please print out the Octavio Configuration Request Form, complete it and return to Diamond as instructed. Customized Octavio embedded application servers can also be created to perfectly match the requirements of your application. Customization options can include the following. Please contact Diamond Systems to request a custom Octavio quote. To request a quote, please download one of the following Octavio Ordering Guides, fill out and return the Octavio Quote Request Form to Diamond Systems as instructed.